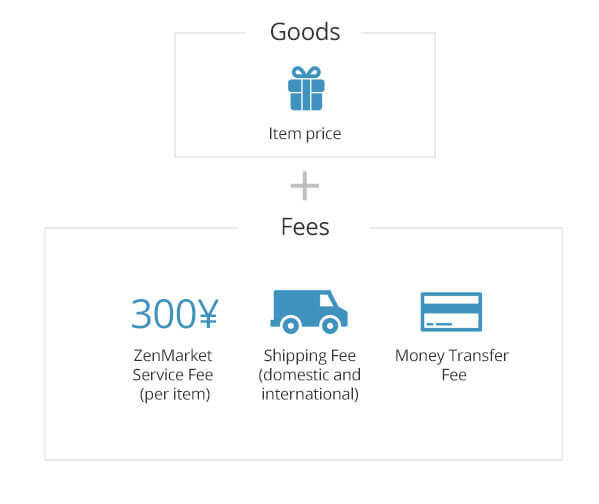 You always pay: item price, ZenMarket service fee (300 yen per item), international shipping fee, funds deposit fee. You sometimes pay: shipping fees within Japan depending on the seller, an intangible goods fee - 8% of the cost of the item (if you purchase intangible goods). You never pay: bank transfer fees within Japan, for initial packing and consolidation of your packages, shipping insurance for our selected carriers, for asking questions, to contact sellers. If you want us to take pictures of your item before shipping internationally, it will cost 500 yen per item. If you want to store your item in our warehouse for more than 45 days, it will cost 50 yen/day per every item. If you want to change the content of a package we have already prepared for shipping, it will cost 1000 yen to repack it. If you want to cancel your purchase after the item arrives at our warehouse, it will cost you at least 1000 yen (and only if the seller accepts returns). If you want to dispose of an item or its part, additional disposal fee of 300 yen per 1 kg may apply (except for items that can be categorized as "household waste"). For some kinds of shipping we also offer additional insurance. Please, use our Fee Calculator to estimate the total cost. Do I have to pay for registration on ZenMarket? No, registration on ZenMarket is free. We don't charge any entrance or membership fees. We charge only 300 JPY ($3) per item no matter how many of the same item or how expensive the item is that you order. If you buy 3 identical T-shirts, our service fee still will be 300 JPY. But if you buy three T-shirts of different sizes or colors, we will charge the service fee for each of them, 900 JPY in this case. What is included in the ZenMarket service fee? By default, the ZenMarket service fee includes buying items, initial package consolidation, repacking and shipping insurance for parcels sent by post, and also domestic bank fees. I want to order several items from different stores. How much do you charge for consolidation? Initial consolidation of packages is totally free of charge. Are there any payment gateway fees? There are no payment gateway fees. However, we charge a ZenMarket deposit fee. It is a flat rate for all payment methods except bank transfer. When paying via an international bank transfer (SWIFT wire transfer), JPY 2,000 is charged and there will probably be additional fees charged by your bank or the intermediate bank. These fees are not disclosed, therefore, it’s not estimated beforehand. I want to check my items before you ship them to me. Can you take a photo for me? This optional service costs 500 yen for each item. It will help you to confirm the condition of your purchased items. We will take 3 photos of your item and will send them to you (you will see a photo icon in the items table). You can order this option when purchasing your item. I want to make my parcel really strong. How much will it cost? We consolidate your items and pack them for free, while regarding the item's fragility, size etc. In most cases, our parcels are strong enough to endure different conditions. But if your parcel is big, heavy, or you are worried about your items security we recommend using our reinforcement service for 1000 yen per box. Your parcel will be strengthened further by using hard pressed carton angles or in another proper way. I created a package and received a quote, but I want it to be reorganized. Is it possible? If you want to change the shipping method, you can do it for free on the Packages page. If you created a package and want your items to be packed in a different way, taken out, split to several packages etc., you can erase your package and create a new one. Erasing a created package costs 1000 yen. Is my parcel insured during international shipping? How much is the insurance fee? We cover all insurance fees for you when sending a package by EMS, AVIA or SAL services, except when using Small Packet type of delivery. In case of trouble, the delivery company will compensate you for the items' price mentioned in the declaration. For Avia Small Packets and SAL Small Packets, the maximum compensation amount is 6000 yen, so, in order to get full value compensation, we kindly ask you to pay a special ZenMarket insurance fee. This fee will help you to receive full compensation, in case your parcel is lost by the postal service. For UPS, FedEx and other shipping methods, the optional insurance fee will be charged separately. How long can I store my items at your warehouse for free? Are there any fees for storage? You can keep your items at our warehouse for free for 45 days. Every day at 7 pm the items are checked by an automatic system, and if at the time of the check the item has been kept in the warehouse for over 45 days, a fee of 50 yen will start to be taken for each item per day (one day is counted as every 24 hours after the item has arrived at our warehouse). Please note, that the fee is taken while the item is physically present at the warehouse, so for example, if you create a package with the item on the 45th day, the fee will be taken until the package is dispatched. We usually need about 2~ days to fully process the package, so please, keep it in mind, and build your calculation based on this information. In total (including the free period), you can keep your items at our warehouse for 90 days. After that your item will be disposed of without any compensation. How can I receive compensation for damaged goods or in other problematic situations? If ZenMarket sent you the wrong item or if an item was damaged by ZenMarket staff, we will offer you options on how we can compensate you for it. If the seller sends wrong or damaged items, full or partial compensation is made only if the seller agrees to do so. Usually, sellers ask to receive the item back and change it to the new one. In this case, they will only compensate for domestic shipping fees. If you buy used items from Yahoo auctions, compensation is not possible in most cases. If your items were lost or damaged during international shipping, compensation of the declared amount is made only if the shipping company agrees to do so. Can I cancel my auction bid or item? Do I have to pay the cancellation fee? You can not cancel your bid or the purchased item for any reason. Can I cancel my items from online marketplaces BEFORE they were shipped to your warehouse? Do I have to pay a cancellation fee? You can cancel items from online marketplaces before they were shipped to us only if the seller agrees to a cancellation. In this case, cancellation is free. Can I cancel my items from online shops AFTER they were shipped to your warehouse? Do I have to pay a cancellation fee? You can cancel items from online marketplaces after they have been shipped to us, only if the seller agrees to the cancellation and you have a strong reason to cancel items. In this case, you will have to pay a 1000 yen cancellation fee per item to ZenMarket, domestic shipping fees to send the item back to the seller, and other expenses if the seller asks for them. The 300 yen of ZenMarket commission for the canceled item will be returned to your account. Can I cancel my items from online shops after they have arrived at my address? You can cancel items from online marketplaces after they arrive at your place, only if the seller agrees to the cancellation and you have a strong reason to cancel the items. In this case, you will have to pay a 1000 yen cancellation fee to ZenMarket per item, international and domestic shipping fees to send the item back to the seller, and other expenses if the seller asks for them. The 300 yen of ZenMarket commission for the canceled item will be returned to your account. A lot of shops accept returns only during a limited period, so a return is only possible if your parcel will arrive back to Japan while there is enough time for cancellation procedures and domestic shipping. Can I purchase intangible goods (game codes, passwords, accounts etc)? If you wish to purchase intangible goods (such as game codes, passwords, accounts etc), that can not be sent by post, we will charge you an additional fee, which will be 8% of the total cost of the item. How does ZenMarket insurance work? The post office insurance covers only the declared value of the parcel. In the case you lower the value, you have to pay part of the undeclared value as your ZenMarket insurance to get protection for the full amount or a part of it. If your package gets lost or stolen, you should first file a claim to the post office for the declared value. If the post office refunds your declared value, we will refund you the undeclared part fully or partially. The insurance fee is calculated by a complicated formula which includes several factors such as number of lost parcels for a certain period for your country, parcel value etc. 1. Set the lowered declared amount from 200,001 yen or higher. 2. Send your items via FedEx or UPS. 3. Try to split your items into several parcels if possible, so that the total value of each one would be under 200,000 yen. The maximum amount of compensation from ZenMarket for one parcel may not exceed 700000 yen. The final decision regarding compensation and its amount is made solely by ZenMarket staff. As of July 1st, 2018, a new Australian Tax legislation came into effect and we are required to collect 10% GST for all parcels sent to Australia with a total value of 1,000 AUD or less. Please note that GST will be applied to parcels where the declared value is equal to or lower than 1,000 AUD. If it applies, the tax will be charged at the same time as the international shipping fee. For high value goods (over 1,000 AUD), customs regulations and the GST payment process remains unchanged and will be processed and charged by customs offices in Australia. Still haven't found the answer? Feel free to contact us. We will gladly answer your questions.